In the DNA Biotechnology unit students are apply their learning of DNA structure to biotechnological applications. DNA electrophoresis, sequencing and databases are studied. Biologists have developed techniques for artificial manipulation of DNA, cells and organisms. Match restriction enzyme names to the bacteria in which they are naturally found. Describe the role of restriction enzymes in nature and in biotechnology applications. Contrast sticky vs. blunt ends. Determine the number and size of DNA fragments after being exposed to restriction enzymes (both linear and plasmid DNA). Demonstrate accurate use of a micro-pipette. Explain the function and purpose of DNA electrophoresis. Describe how and why DNA fragments separate during electrophoresis. Outline the functions of the buffer, marker and loading dye in DNA electrophoresis. In gel electrophoresis DNA fragments move in an electric field and separate from each other according to their sizes. The smallest fragments will move the farthest distance from the origin of the DNA sample. State the function of the PCR. 3.5.U4 ​Genetic modification is carried out by gene transfer between species. Contrast sexual and asexual reproduction. Describe different ways in which natural clones can arise. 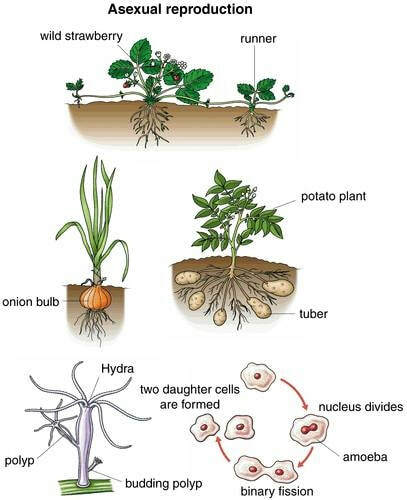 3.5.U6 ​Many plant species and some animal species have natural methods of cloning. (Oxford Biology Course Companion page 196). ​Clones are groups of genetically identical organisms that are derived from a single original parent cell. Cloning is the process through which these identical organisms are produced. The size of clones can range from two (i.e. identical twins) to hundreds (i.e. crops of commercially grown plants). Organisms that reproduce asexually, which results in genetically identical organisms. Sexual reproduction produces genetically different organisms as a result of gamete fusion. Describe the process of reproductive cloning via embryo splitting. Outline example of cloning animal embryos via natural and artificial embryo splitting. 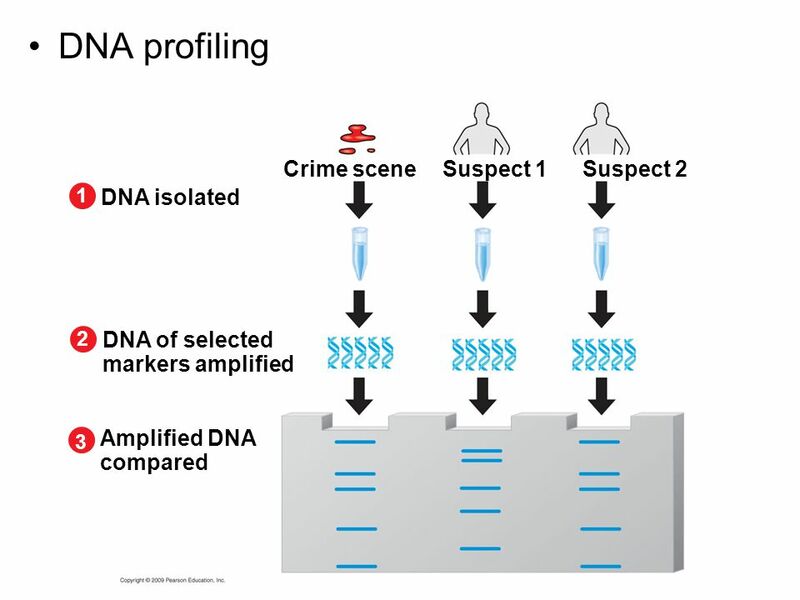 DNA profiling involves the use of gel electrophoresis of DNA. 3.5.A2 ​Gene transfer to bacteria using plasmids makes use of restriction endonucleases and DNA ligase. 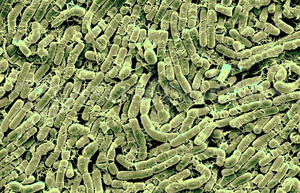 E. coli is used in gene technology because some of its DNA is found on plasmids (smaller circles of DNA). These plasmids can be removed and cleaved by restriction enzymes at target sequences. DNA fragments from another organism can also be cleaved by the same restriction enzyme, and these pieces can be added to the open plasmid and spliced together by ligase. The recombinant plasmids formed can be inserted into new host cells and cloned. When genes are transferred between species, the amino acid sequence of polypeptides translated from them is unchanged because the genetic code is universal.The basic technique in gene transfer is outlined below. 3.5.A3 ​Assessment of the potential risks and benefits associated with genetic modification of crops. 3.5.A4 ​Production of cloned embryos produced by somatic-cell nuclear transfer. Oxford Biology Course Companion page 199). ​Outline the production of Dolly the sheep using somatic cell nuclear transfer. 3.5.S1 ​Design of an experiment to assess one factor affecting the rooting of stem-cuttings. 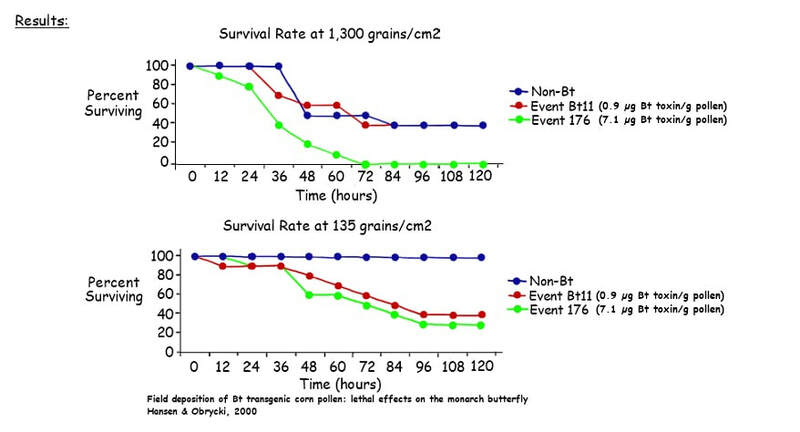 3.5.S3 ​Analysis of data on risks to monarch butterflies of Bt crops. ​The pollen contains the expensed insecticidal toxins of th eBt gene that kills monarch larva. ​​​​​​​​​​​​Correct use of terminology is a key skill in Biology. It is essential to use key terms correctly when communicating your understanding, particularly in assessments. Use the quizlet flashcards or other tools such as learn, scatter, space race, speller and test to help you master the vocabulary. Click here for an animation of Plant Gene Transfer. Positive news about gene-transfer successes in SCID treatment, from Nature. David Suzuki talks about GMO and the precautionary principle. For more about the precautionary principle, refer to 5.2 Greenhouse Effect. Good extract from The Geek Manifesto by Mark Henderson on GMO’s and protestors. Here is an interesting, if superficial, infographic on why we need more robust crops in many regions of the world. Your challenge – find out how these crops are modified and produced. But do GM crops encourage resistance and increased pesticide and herbicide use? from the Guardian. This article from oneinsevenpeople outlines the use of GM mosquitoes in fighting dengue. But is there a serious knowledge gap standing in our way? Extinct Pyrenrean Ibex cloned back into existence – for seven minutes. ​PCR is a process of amplifying the target DNA sequence using Taq DNA polymerase and a set of primers. This whole process is conducted in a thermocycler machine also known as a PCR machine that repeatedly changes temperature cycles to complete the process of DNA amplification. Explore electrophoresis with The Amoeba Sisters! This biotechnology video introduces gel electrophoresis and how it functions to separate molecules by size. As Chair of the Department of Agronomy, head of the Department of Genetics and Biotechnology at the Biotechnical faculty, University of Ljubljana, Borut Bohanec possesses a broad overview of classical and modern techniques of plant breeding. For many years he has been following advances in the field of genetically modified organisms and wishes for better understanding of the issue among the general public. This short clip from Science in Europe outlines the state of GM food in Europe and has a nice explanation of the precautionary principle (it fits better here than in the Greenhouse Effect unit). ​In 1997, Scottish scientists revealed they had cloned a sheep and named her Dolly, sending waves of future shock around the world that continue to shape frontiers of science today. Any molecular biologist will tell you that genetic engineering is tricky. But up until recently we might be witnessing a new age in human development. Now that genetic engineering tools like CRISPR allow us to edit our genes, how will that impact human evolution going forward? Are designer babies or eugenics around the corner? Welcome to a world of nonrandom mutation and unnatural selection. ​ Scientist and community lab advocate Ellen Jorgensen is on a mission to explain the myths and realities of CRISPR, hype-free, to the non-scientists among us. CRISPR gene drives allow scientists to change sequences of DNA and guarantee that the resulting edited genetic trait is inherited by future generations, opening up the possibility of altering entire species forever.